As president and CEO of the state’s largest health insurer, Wilson is dedicated to improving North Carolina’s health care system, making health care more affordable and helping BCBSNC adapt in a changing health care environment. Wilson works with the Council for Affordable Healthcare Quality and the National Institute for Health Care Management to address health care challenges at the national level. That work continues in North Carolina, where he serves on the board of the North Carolina Institute of Medicine and chairs the Blue Cross and Blue Shield of North Carolina Foundation — an independent charitable organization that has invested more than $68 million in community-based health and wellness efforts over the last decade. 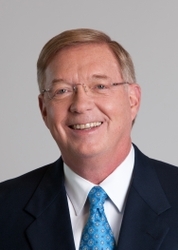 Wilson is a member and past chair of the University of North Carolina Board Of Governors. He is also a director of the Blue Cross and Blue Shield Association and serves on the boards of the Tomorrow Fund, the Long Term Care Association, the North Carolina Health Information Exchange and BCS Financial Corporation. In addition, he serves on the Board of Visitors of the Wake Forest University School of Law. Wilson, who joined BCBSNC in 1995, held a range of senior-level positions before being tapped to lead the organization in 2010. Previously he practiced law and served as general counsel to Gov. Jim Hunt, directing the governor’s legislative strategy and heading his legal department. A lifelong North Carolinian, Wilson holds a bachelor’s degree from Appalachian State University, a master’s degree from Duke University and a law degree from Wake Forest University. He is a recipient of the Order of the Long Leaf Pine, the highest civilian honor bestowed by the governor of North Carolina. Wilson is married and has two adult children.